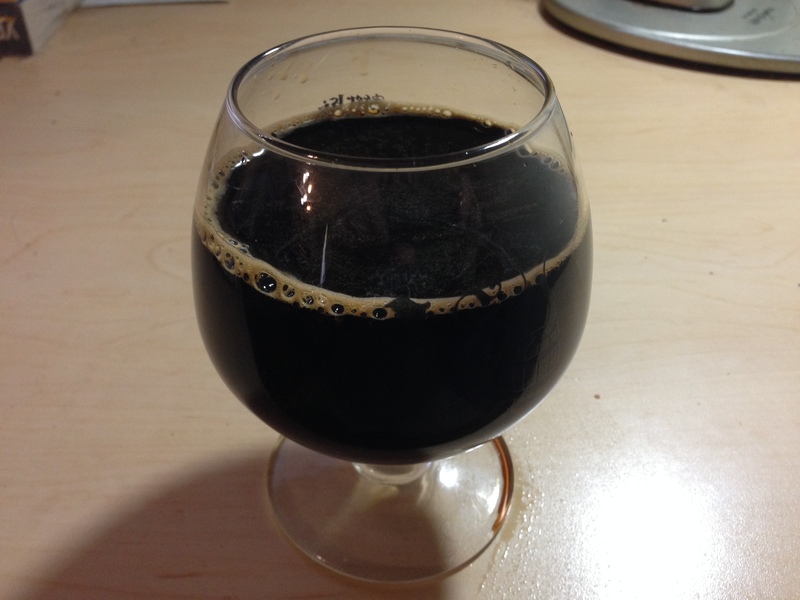 This is the fifth article in this series on Russian imperial stouts. Russian imperial stouts are big beers. The BJCP gives the range of original gravities (OGs) as 1.075–1.115. In practice, most commercial examples fall in the lower half of that range. When it comes to wort production, you have several options. The first option is to formulate a recipe at your usual extract efficiency, then fully sparge the grain bed. You will likely collect at least 0.60 gallons of wort per pound of grain (5.0 L/kg), and yield wort with a pre-boil gravity around 11 ° Plato (SG 1.044). The benefits of this method are that you get the most from your grain. Drawback is that it requires a long boil to evaporate your wort down to its target post-boil volume. For homebrewers with a smaller mash tun, but a fairly large kettle, this may be their best option. The all-grain Russian imperial stout recipe I posted earlier uses this approach. In it, you collect 12 gallons (45 L) of wort and boil it down to 5.0 gallons (19 L), which would take at least 4.5 hours with a reasonably vigorous boil. The opposite of this approach would be to formulate a recipe so that your entire pre-boil wort volume is first wort (the sweet wort that freely drains from the mash tun before sparging begins). At normal homebrew mash thicknesses, the gravity of your first wort could be as high as 24 °Plato (~SG 1.096). So, even a one-hour boil would yield a very high gravity beer. In this case, you have substituted the cost of extra grain for the time and fuel cost associated with a long boil. A grain bill of 38 lb. (17 kg) of malt should yield around 6.0 gallons (23 L) of first wort at SG 1.096. [This assumes that the grain absorbs 0.15 gallons of wort per pound of grain (1.25 L/kg).] If your kettle size is limiting, but you have a lot of mash tun space — perhaps because you’ve borrowed a friend’s mash tun and are using two — this is a good option. You also have the option of brewing a second beer from the sugars left over in the grain bed. Of course, most homebrewers pick a compromise between these two extremes. And often the compromise is based on their equipment. Frequently they load their mash tun up with as much grain as it will hold, collect as much wort as their kettle will hold, and perhaps add some malt extract to reach their target original gravity (OG). You can also use malt extract for some or all of the fermentables in your beer. If you use malt extract, doing at least a partial mash is highly recommended. With a partial mash, you can raise the fermentability of the wort, so you avoid ending up with a beer that’s overly sweet or too filling. The fermentability of all-grain wort is generally greater than that of extract wort. So, simply producing some wort from a mash will help with the fermentability. In addition, you can add at least some of your malt extract to the all-grain portion of your wort and lot its enzymes work on the carbohydrates in the malt extract. In the extract recipe, I used this approach. Given the large grain bill of a Russian imperial stout, there are other options that some homebrewers take. Brewing a smaller volume is one. Alternately, he or she may choose to fill his or her fermenter with two batches of wort. If you can’t comfortably brew 5.0 gallons (19 L) of Russian imperial stout with your existing setup, you could produce 2.5 gallons (9.5 L) of wort one day, and get the fermentation started. The next day, you could make another 2.5 gallons (9.5 L) of wort and add it to the actively fermenting beer from the day before. Mash your Russian imperial stout mash to yield wort with a moderate to high degree of fermentability, and rely on the high OG to ensure it will still finish at a fairly high final gravity (FG) and be full-bodied. A single infusion mash in the range of 148–152 °F (64–67 °C) for 60 minutes should work well for this. Although your mash tun space may be limiting, avoid the temptation to mash too thickly. A mash thickness around 1.25 qt./lb. (2.6 L/kg) will work fine. If you stir the grains several times during the rest, you can perhaps get away with a mash as thick as 1.0 qt./lb. (2.1 L/kg). As an option, you can stir in some of the dark grains near the end of the mash. This will make for easier lautering and perhaps make it easier to hit your mash pH. (See the article on strike water chemistry for more on this.) The best way to do this is to mix the crushed dark grains with hot water to yield a temperature near your mash temperature. Then stir this mixture into the top third of your great bed. Let grains mash at least the last 5 minutes of the main mash before beginning to collect the wort. As with any beer, your goal in lautering is to collect what you do want (sugars) from the grain bed, while leaving behind compounds that you don’t want (tannins). In a Russian imperial stout, a big concern is going to be tannins. Dark grains are more likely to yield tannic beers; and Russian imperial stouts have a lot of dark grains. A little bit of astringency from tannins is expected in most dark beers. However, an excessive amount of astringency is not desirable. A common cause of astringency in beers is oversparging. Given the large amount of wort you are collecting, oversparging is not likely to be a problem. However, if your water has a large amount of carbonates in it, you may rinse out excessive tannins near the end of wort collection. As such, do not add baking soda or chalk to your sparge water, even if you added it to your strike water. If your water is naturally high in carbonates, you may consider neutralizing them with acid, or diluting the water with distilled water. In the next article, I’ll discuss boiling and hops.